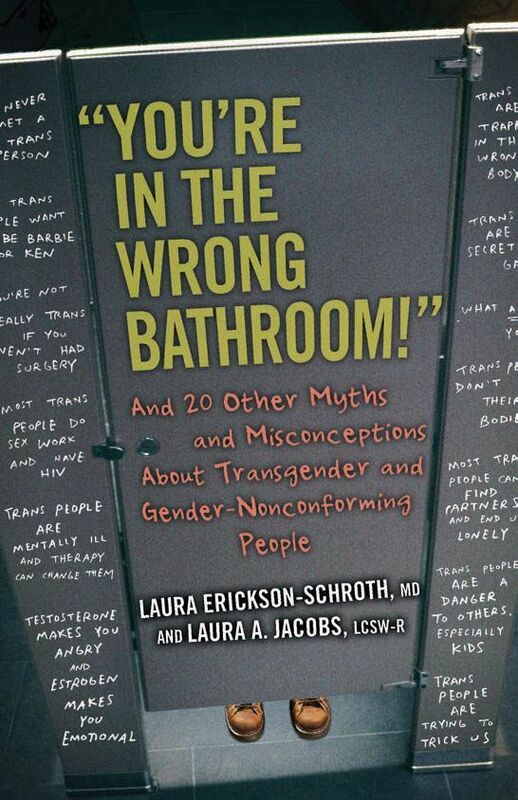 Laura Erickson-Schroth and Laura Jacobs on the importance of their new book, You’re In the Wrong Bathroom!, which tackles myths surrounding transgender rights and identity. HOW DO YOU EACH IDENTIFY? Erickson-Schroth: I’m a queer woman and also gender nonconforming/genderqueer. Jacobs: I identify as trans and genderqueer, and as a heretic. I do not identify as having been ‘born in the wrong body,’ but instead feel I came to my gender through a process of nonjudgmental exploration, and now describe myself as dapper, ambiguous without being androgynous. I am a trans woman performing my own variety of female masculinity. YOU WROTE THE BOOK BEFORE THE ELECTION. IS THE BOOK IS EVEN MORE RELEVANT NOW? Erickson-Schroth: This book may be even more necessary now than it would have been during the Obama era because of the recent threats to safety and legal rights of LGBTQ people. It seems that myths and misperceptions about trans people continue to spread on a daily basis.